WASHINGTON (CNN) - After a hard-hitting Saturday Night Live skit that mocked President Obama for accomplishing "nothing, nada" so far in his presidency, could Obama, like former Alaska Gov. Sarah Palin, become synonymous with biting SNL impersonations of him? In the latest installment of CNN=Politics Daily, Senior White House Correspondent Ed Henry and Senior Political Analyst Gloria Borger weigh in on SNL's latest Obama spoof. Plus: The White House is struggling to control increasingly public infighting over the President's strategy in Afghanistan. Comments by General Stanley McChrystal and a push-back Sunday on CNN's State of the Union by Obama National Security Adviser Jim Jones illustrate the friction within the administration. Ed Henry reports on the differences of opinion within the president's inner circle and the Democratic Party. Finally: An attack by the Taliban on a remote U.S. outpost in Afghanistan results in the deadliest day for U.S. troops in the country in more than a year. CNN Pentagon Correspondent Barbara Starr explains what happened. WASHINGTON (CNN) - As the war in Afghanistan nears the start of its ninth year, a group of anti-war protesters gathered in front of the White House today to express their disappointment that the wars in Iraq and Afghanistan are not yet over, and to request a meeting with President Obama. An estimated 500 people from different anti-war groups gathered on the sidewalk in front of the White House. A few chained themselves to the fence, some laid down on the sidewalk as if they were dead, and others chanted: "mourn the dead, heal the wounded, end the war!" The protest was peaceful, though U.S. Park Police said that 61 people were arrested for failure to obey a lawful order after the crowd was repeatedly asked to move back from the sidewalk. According to Park Police Sgt. David Schlosser, all were cited and released. 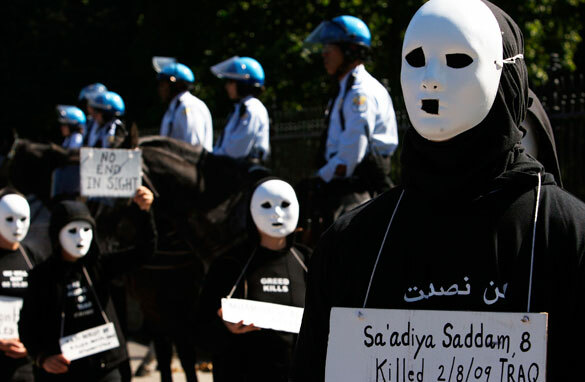 Cindy Sheehan, whose son was killed in Iraq in 2004, was among the protestors, and was one of those who were arrested. She said she had not been a supporter of President Obama or of Sen. John McCain during last year's election but said protestors were running out of patience. "I think the mood of the country and the mood of our movement is getting a little bit more desperate, and (that) this will be the time to be able to translate our tireless activism and work for peace," she said. 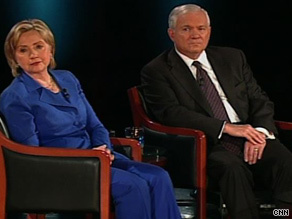 Clinton and Gates spoke with Amanpour Monday in an interview set to air on CNN. WASHINGTON (CNN) - Defense Secretary Robert Gates declared Monday that the United States will remain in Afghanistan for the foreseeable future, no matter what President Barack Obama decides on immediate troop levels. "We're not leaving Afghanistan," Gates said in an interview with CNN's Christiane Amanpour that also included Secretary of State Hillary Clinton. "There should be no uncertainly in terms of our determination to remain in Afghanistan and to continue to build a relationship of partnership … with the Pakistanis," Gates said. "That's a strategic objective." Watch Amanpour's full interview with Gates and Clinton Tuesday at 3 pm ET on CNN. WASHINGTON (CNN) - Defense Secretary Robert Gates said Monday that the Taliban insurgency currently has the momentum in Afghanistan, and a Taliban takeover of the country would empower the al Qaeda terrorist network. "Because of our inability and the inability, frankly, of our allies to put enough troops in Afghanistan, the Taliban now have the momentum," Gates said in an interview with CNN's Christiane Amanpour that also included Secretary of State Hillary Clinton. Gates added that an eventual Taliban victory would provide "added space" for al Qaeda to set up in the country and enhance recruiting and fundraising, bolstered by the perspective of a second victory over a superpower by Muslim forces after driving out the Soviet Union in the 1980s. 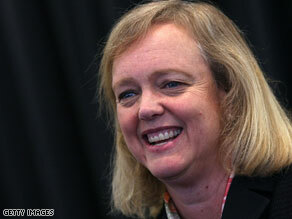 Meg Whitman will no longer be raising money for Bob McDonnell in Virginia. WASHINGTON (CNN) - Former eBay CEO Meg Whitman's appearance at a Virginia fundraiser this week for Republican gubernatorial candidate Bob McDonnell has been canceled. McDonnell's campaign said the fundraiser, to be held at a private home in northern Virginia, was canceled last week because "scheduling reasons prevented it from happening." John Backus, a businessman who was scheduled to host the gathering and has known Whitman for years, said the fundraiser could not be postponed because his wife is giving birth, but he told the campaign to add his name to another area fundraiser later in the month. He said Whitman wouldn't be attending the re-scheduled event. Tucker Bounds, a spokesman for Whitman, said the fundraiser was canceled because "our campaign has a scheduling conflict." The calendar re-shuffling might be good news for Whitman, who is now seeking the GOP gubernatorial nomination in California and faces a potentially difficult three-way primary. After all, national Democrats have been eager to draw attention to McDonnell's controversial master's thesis that called working women "detrimental" to families, and they have skewered the Republicans who have journeyed to Virginia since the document was uncovered. Mitt Romney, Tim Pawlenty, Bobby Jindal and Newt Gingrich have all been labeled conservative extremists by the Democratic National Committee for campaigning with McDonnell. On Monday, the DNC released a Web video with a warning for potential McDonnell surrogates: "You campaign with Bob McDonnell," the video cautions, "you're playing with fire." 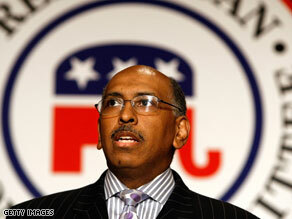 Republican National Committee Chairman Michael Steele has been harshly critical of ACORN. WASHINGTON (CNN) - Like other GOP leaders, Republican National Committee chairman Michael Steele took a harsh tone toward ACORN last month after several of the group's employees were caught on tape offering financial advice to activists posing undercover as a pimp and prostitute. On September 15, after the Senate voted to defund the community organizing group, Steele released a statement accusing ACORN of "nefarious activities," saying it uses "illegal means to achieve its ends." A few days later, on September 24, Steele called for congressional Democrats to investigate the "corrupt organization" and said damage control efforts by ACORN officials were "insulting." But during a speaking appearance in the days between issuing those two statements, Steele had kind words for ACORN and its CEO, Bertha Lewis, who happened to be guiding that so-called damage control. Appearing September 21 at Philander Smith College, a historically black college in Arkansas, the RNC chairman spoke diplomatically of the group and its history of organizing in low-income communities. "The organization has a problem that it needs to deal with," Steele told the audience in remarks that were recorded and posted on YouTube over the weekend. "I will say that current head of the organization, she has done a phenomenal job of getting out in front of it. I applaud her. I take her at her word that she wants to make sure that the bad apples are thrown out." WASHINGTON (CNN) - The Federal Trade Commission passed new guidelines Monday that advise bloggers and celebrities to clearly disclose their relationships with advertisers. "The test here is, if the relationship were known between the blogger and the advertiser, would that affect the credibility of the endorsement?" FTC assistant director of advertising practices Richard Cleland told CNN. "That question has to be determined on a case by case basis. What we have produced is a general guidance that says in certain cases receiving a free product is not any different than being paid directly for an endorsement." Cleland admits there will be no new team to monitor all the blogs, and that enforcing these guidelines would be a "game of whack-a-mole" given the numbers involved. The new guidelines are viewed as more of an educational tool than any kind of requirement, and geared at advertisers more than bloggers. If numerous complaints are filed regarding a blog, the FTC is likely investigate that the advertiser has properly advised the blogger of these guidelines. The rules, which go into effect December 1, do not mandate the manner in which the disclosure should be made, stipulating only that it should be clearly visible, and easy to understand. Nor does the 81-page document specify a penalty for bloggers or advertisers if the guidelines are violated. Bloggers aren't surprised by the new regulations, said Susan Getgood, co-founder of the Web site Blog With Integrity, which advises bloggers about advertising and ethics: "We have been talking about it for a long time, this document just makes it clearer." New GOP ad hits Deeds on remark to female reporter. (CNN) - After weeks of Democratic attacks on Republican Bob McDonnell's 20-year-old comments on women in the workplace, the GOP is going on the offensive in the Virginia governor's race, hitting Creigh Deeds over a public comment to a female reporter. The Republican Governor's Association is launching a 30-second TV spot that points to the Democratic gubernatorial candidate's post-debate press conference last month, where he referred to a female reporter as "young lady." "Did you catch that?" the ad asks, after showing the back-and-forth exchange. "It gets worse." The commercial, which will air heavily across the state this week, comes after a major Democratic push to focus the race on views in McDonnell's thesis two decades ago. The Republican's recently-reported comments on working women and other social issues have become a lightning rod issue in the campaign, and are credited with helping Deeds close the gap with his GOP opponent over the closing months of the race. McDonnell is also out with a positive ad promoting his plans to improve the state's transit system. "Better roads mean better jobs," McDonnell says in the 30-second spot, set to run in Northern Virginia. 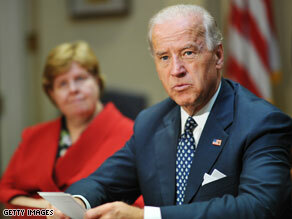 Biden to campaign in New Jersey and Virginia. WASHINGTON (CNN) - The White House is dispatching Vice President Biden to New Jersey and Virginia later this week to campaign for each of the state's Democratic candidates for governor. Biden will speak alongside Jon Corzine at the New Jersey AFL-CIO 2009 Legislative Conference in Atlantic City on Wednesday at the Borgata Hotel. The Vice President will then return to the Washington area to raise money for Democrat Creigh Deeds the next day at a private home in Alexandria. The visits mark the second time this year Biden has lent some administration firepower to the two gubernatorial campaigns - he first appeared with Corzine at a campaign rally in June, and helped Deeds raise money in July. 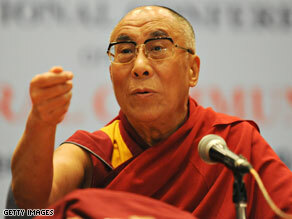 Dalai Lama to meet with Obama after his trip to China. WASHINGTON (CNN) -President Barack Obama will meet with the Dalai Lama after the president's trip to China, the State Department said Monday. Department spokesman Ian Kelly told reporters. "The president has decided that he will meet with the Dalai Lama at a mutually agreeable time."